Kant Offers No Apology for Mold Issue in Fiery Student Senate Meeting | The Gettysburgian. Keira Kant, Associate Dean of College Life for Residential and First-Year Programs, answered questions at Monday night’s Student Senate meeting relating to the Hanson Hall mold situation in what started as a largely respectful dialogue and metamorphosed into a seemingly cathartic venting of grievances. Students expressed frustrations with what they view as a lack of communication and concern for the Hanson residents throughout the entire process. Kant defended the institution and said that her presence at the meeting was emblematic of how seriously the college is taking the issue, but she could not promise any specific changes in light of the feedback. Kant did not take the opportunity to apologize for the mold situation, even when pressed by senators to do so. At the board meeting, Andrew Fitzsimmons ’19 and Senate President Luke Frigon ’18 discussed the possibility of taking legal action against the college with Frigon raising the possibility of a class action lawsuit and pledging to look into it further, noting that, to date, he believes the college is not treating students like adults. Update: On Tuesday afternoon, Vice President of College Life and Dean of Students Julie Ramsey issued an apology that can be read here. What began as a largely respectful dialogue and airing of concerns relating to the college’s handling of the mold situation at Hanson Hall during the 80-minute regularly scheduled meeting of the Gettysburg College Student Senate metamorphosed into a seemingly cathartic venting of grievances relating to the college’s lack of responsiveness and accountability towards facilities issues in an open session of the Senate’s Board of Directors. The meeting opened with a presentation by Associate Dean of College Life for Residential & First-Year Programs (RFYP) Keira Kant, who came at the invitation of the Senate Board of Directors to answer questions and hear student perspectives on the issue. At the previous week’s Senate meeting, students expressed frustration that the college had initially promised basement residents priority housing and then changed course when the scope of the project changed from remediation of the basement only to cleaning the entire building as well as reports of property damage in excess of the $250 that each Hanson Hall resident was given as compensation. Kant and Danielle Phillips, Director of RFYP, reviewed the timeline for the college’s response to the mold discovered in Hanson Hall over winter break before opening the floor to questions and comments. Many student comments centered around why the college did not do more sooner given that mold has been endemic to Hanson Hall in recent years according to dozens of student reports that have surfaced in recent weeks. “There is no official standard for how much mold is too much mold,” Kant said, noting that the Environmental Protection Agency has no guidelines for air quality and that the college has relied on the recommendations from Compliance Management International (CMI), an environmental consultant, to respond to the issue. Currently, the college does not do any ongoing or proactive assessment of air quality in residential buildings, but, in light of the issues at Hanson Hall, CMI will make recommendations to the college on procedures to monitor and respond to mold in the future across campus, Kant said. In an email to The Gettysburgian sent Tuesday afternoon, Vice President of College Life and Dean of Students Julie Ramsey said that the college would add proactive visual assessments to its regular summer maintenance of buildings. “The College will add an additional room-by-room visual inspection for mold as part of the summer room check process in order to proactively identify any issues,” she said. Other questions probed how the college arrived at its decision to compensate each Hanson Hall resident $250 and why priority in the upcoming sophomore housing lottery was no longer being offered to basement residents, who were initially promised that they would receive such priority in an email sent Jan. 24. Kant conceded that the college did change its plans after the scope of the project changed from the initial assessment, which was that only the basement needed remediation and that it could wait until after the semester, to its final determination that all floors were affected and remediation needed to begin immediately. Furthermore, she admitted that basement residents were not consulted or even notified of the decision to shift compensation from housing priority to a $250 housing credit before the decision was released generally; Senator and former basement resident Abby Hauer ’21 noted that many residents read about the decision in The Gettysburgian. With respect to the amount of the credit and whether property damage in excess of that figure would be further compensated, Kant deferred to Financial Services for the $250 figure and said that homeowner’s or renter’s insurance may cover additional expenses, referring students to Regina Campo, Co-Director of Human Resources, for more information. “[The $250] is meant to address inconveniences students had,” Kant said. Ultimately, Kant defended the institution and said that her presence at the meeting was emblematic of how seriously the college is taking the issue, but she could not promise any specific changes in light of the feedback. In closing the conversation with Kant, Senate President Luke Frigon, who said at last week’s meeting that the college should “keep its word” and “pay [students who had property damage” back,” said that among his greatest concerns was that no one from the college apologized to affected residents. Kant did not take the opportunity to do so. “I think we can push more accountability,” Frigon said before Senate pivoted to discussing other matters. After the Senate adjourned, however, an open meeting of the Board of Directors was held to debrief the conversation with Kant and discuss paths forward on the mold issue, and those in attendance quickly abandoned the largely dignified tone of the official meeting to excoriate the college and specifically RFYP for its handling both of the Hanson Hall issue and maintenance and facilities concerns systemically. “I don’t want to bash Keira,” Frigon said to open the conversation before opening the floor. Senate Parliamentarian and Policy Committee Chair Patrick McKenna ’20 honed in on the lack of an apology and decried what he views as a systemic failure by the college. Senate Clubs Liaison Jackie Crowley ’20 noted that Gettysburg requires students to live on campus throughout their time at Gettysburg, so it should have an obligation to make sure those living accommodations are functional. Anders Spittal ’20 objected to a comment from Kant that it would be up to individual students to seek accommodations from Academic Advising if they need assignment extensions or support because of being required to move in the middle of the week or anything else related to the mold situation; Senate Treasurer Sarah Berkowitz ’18 called it “baffling” that there was no communication with Academic Advising about such issues and said that, even in her senior year, she would not know how to approach such a conversation. 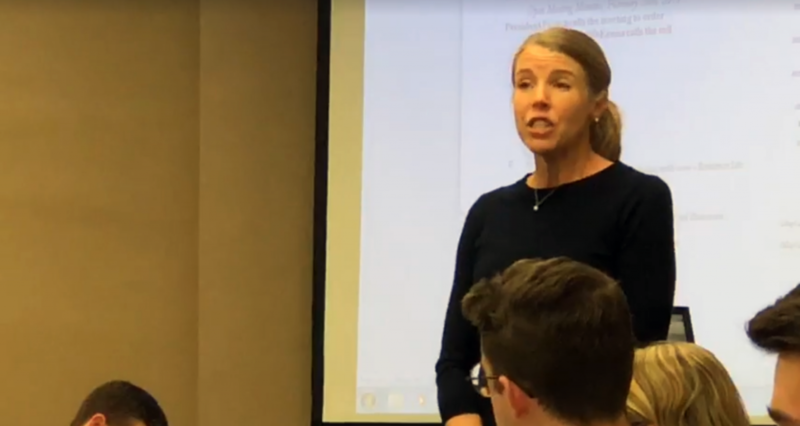 On Tuesday afternoon, Ramsey invited any students with ongoing academic issues stemming from the Hanson mold situation to contact her directly, and she will work with Academic Advising on a case-by-case basis. As the discussion moved towards next steps, senators and other attendees discussed the need for formal policy changes, institutional pressure, and support for Hanson residents. “The most important part is, moving forward, there needs to be an institutional policy change [in how maintenance issues are evaluated and addressed],” said Senator Jack Lashendock ’20. Senator Haley Gluhanich ’19 suggested the Opinions Committee draft an opinion urging the college to test for mold in all buildings, which Committee Chair Michael Mancuso ’19 said his committee could begin working on this week. Several attendees at the meeting suggested that this was ultimately a public perception issue for the college and that threats of exposure at Get Acquainted Day and signs that students would see during admissions visits would be opportunities to get the college’s attention. Frigon demurred at the suggestion Senate should be involved in such efforts, but he suggested that students could do so on their own if they felt strongly about the issue. Sticking with the public relations theme, Andrew Fitzsimmons ’19 suggested that Senate could coordinate efforts to help students required to switch floors during the coming days move their belongings would be an opportunity to support the people most affected by the issue. Cognizant of Senate’s slogan “Senate Works,” Fitzsimmons suggested the adaptation “Senate works. Res Life doesn’t,” as a possible rallying cry for the effort. Fitzsimmons and Frigon also went back and forth on the possibility of pursuing legal action against the college with Frigon raising the possibility of a class action lawsuit and pledging to look into it further, noting that, to date, he believes the college is not treating students like adults. In an informal gaggle after the conclusion of the Board of Directors meeting, attendees developed plans to potentially assist Hanson residents in moving over the weekend and to work on shaping public opinion in the days to come. McKenna cited the way the college brands itself as a residential college as a juxtaposition to how the college has handled this situation. Editor’s Note: If you have had an experience — positive or negative — with maintenance at Gettysburg College, please tell us about it by completing this Google Form. Please contact editors@gettysburgian.com with any questions.